1 Rinse sorrel well and spin dry. 2 Remove any thick stems from sorrel and coarsely chop the leaves. Squeeze juice from lemon half. 3 Place sorrel in a tall vessel. Add yogurt, tofu and 1 teaspoon lemon juice; season with salt and pepper. Puree with an immersion blender. 4 Rinse asparagus, trim woody ends and peel stalks. 5 Thinly slice asparagus on the diagonal and set aside. 6 Rinse scallions, pat dry and slice thinly. 7 Rinse salmon, pat dry and cut into strips, about 2 cm (approximately 3/4 inch) wide. Place skinned side up on work surface and roll up each salmon piece from a short side and thread onto a wooden skewer. Season with salt and pepper. 8 Heat half the oil in a large nonstick pan over high heat. Cook asparagus until crisp-tender, 4-5 minutes. Season with salt, pepper, a pinch of sugar and the remaining lemon juice. 9 Meanwhile, heat the remaining oil in a small skillet over high heat. Cook salmon skewers until browned in spots, about 2 minutes per side. 10 Stir scallions into asparagus and cook until slightly wilted, about 1 minute. 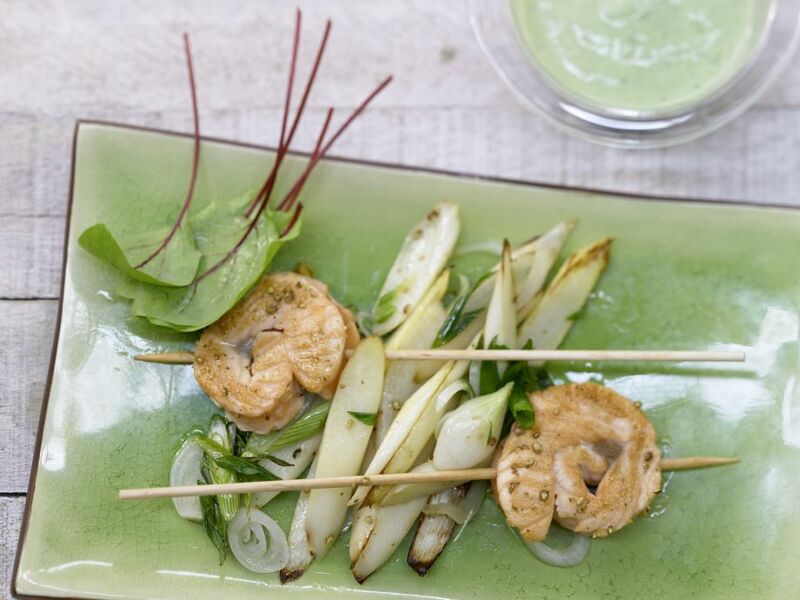 Serve salmon skewers on a platter along with the asparagus-scallion mixture and sorrel cream.